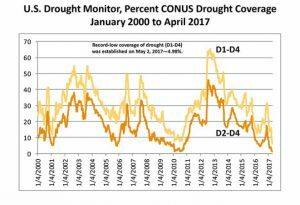 US Weather–What’s ahead for this summer? Chris Robbins off iWeatherNet.com posted some information about Friday’s weather on his Facebook page Thursday night for Atlanta/Athens/N. Georgia. 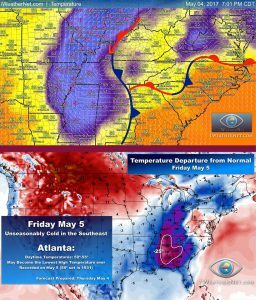 He noted that Friday’s high temperatures in places like Atlanta and Athens GA would likely be set overnight as a strong cold front passes through the state, dropping temperatures after it passes…. Will we break our string of above-normal months in May?